Jared Koster rushed for 184 yards and two touchdowns on 20 carries as Garden City survived WAC rival Great Bend, 28-21. Koster scored his two touchdowns in the third quarter as the Buffs opened up a 28-14 lead after halftime. Trent Uselton led Great Bend with 109 yards on 12 carries, including a 73-yard touchdown run early in the game. Derby scored in every quarter en route to a 35-14 win over Mill Valley. Curtis Whitten rushed for 110 yards and two touchdowns to lead the Panthers. Quarterback Brady Rust passed for 123 yards and rushed for 95 more. Christian Jegen rushed for 137 yards and two touchdowns on 15 carries and caught five passes for 107 yards for Mill Valley. Brendan Watkins rushed for a short touchdown late in the fourth quarter to propel Olathe Northwest over Leavenworth 15-6. The Ravens’ lead was only 8-6 before Watkins’ deciding score. Adam Harter rushed 19 times for 85 yards to lead Olathe Northwest. Quarterback Jack Hatzfeld rushed for an early score to give the Ravens a 6-0 lead. The game stayed that way until the third quarter when a Leavenworth punt resulted in a safety for Northwest. The Pioneers then pulled to within 8-6 on a Landry Hodges touchdown pass to Isaiah Ross. St. James Academy improved to 3-0 after a 14-0 shutout of De Soto. Jake Burgmeier rushed for 108 yards and a score on 18 carries to lead the Thunder. Mitchell Zubradt caught three passes for 73 yards and the Thunder’s other score. St. James Academy forced four De Soto turnovers, including two interceptions by Braxton Lewis. Emporia rushed for 526 yards and six touchdowns as the Spartans defeated Topeka West 75-7. The Spartans led 68-7 at halftime. Emporia quarterback Tanner Taylor completed 7 of 8 passes for 77 yards and two touchdowns, while rushing for 160 yards and two touchdowns on six attempts. Emporia senior Dylan Schlote ran for 116 yards and two touchdowns on eight carries. Lansing earned its first victory of the season, defeating Tonganoxie 37-12. Lions quarterback Krystian Abbott completed 14 of 22 passes for 177 yards and a touchdown. He also rushed for 67 yards on five attempts. Lansing’s Dewaun Wilkes ran for 135 yards and three touchdowns on 18 carries. Tonganoxie’s Jared Sommers compiled 127 yards of total offense. Andover Central junior running back Jordan Birch rushed for 229 yards and three touchdowns on 22 carries as the Jaguars topped Goddard 28-7. Goddard held a 7-0 lead after the first quarter. Andover Central never led the Lions passing game get off the ground. Goddard was limited to one yard passing with two interceptions. Dakota Driskill led Goddard with 127 yards rushing. Atchison improved to 3-0 with a 27-26 win over KC Washington. The start is even more impressive when you consider the Redmen finished 4-5 a year ago. Atchison trailed 14-6 after the first quarter and 14-12 at halftime. The Redmen outscored KC Washington 9-0 in the third quarter and then held off the Wildcats in the fourth. Atchison quarterback Wykeen Gill passed for 128 yards and a touchdown and rushed for 52 yards and a touchdown. Rose Hill earned its first win of the season by beating El Dorado 46-14. Junior quarterback Brett Bonar completed 17 of 23 passes for 288 yards and three touchdowns to lead the Rockets. Rose Hill senior Drew Rodman caught seven passes for 126 yards and two touchdowns. Ottawa scored a touchdown with 0.3 seconds remaining in the game to overtake Spring Hill 44-43. The Cyclones trailed 43-37 until Isaac McCullough hit Tyler Smith on a 12-yard touchdown pass to tie the game at 43 with less than a second remaining. Luke Snider then converted the PAT to give the Cyclones the 44-43 win. McCullough passed for 250 yards and two touchdowns in the game. Spring Hill quarterback Ryker Johnson completed three passes, but all three went for touchdowns. Tyler Burns rushed for 365 yards and seven touchdown as Wichita Trinity outscored Chaparral 53-46. Chaparral led 20-14 at halftime before Trinity scored 26 points in the third quarter to take a 40-27 lead. Chaparral quarterback Shawn Nulik rushed for three touchdowns and passed for more than 330 yards and three more scores in the loss. The Nickerson Panthers picked up their first win of the season by beating Lyons 28-3. The Panthers scored 20 points in the first quarter to take control. The victory snapped a 13-game losing streak for Nickerson dating back to October 12, 2012 when the Panthers defeated Cheney, 26-20. Santa Fe Trail rolled past Royal Valley 55-13 to improve to 3-0. The Chargers scored 48 points in the first half as Chaz Wright scored three of his four touchdowns. Wright finished with 128 yards rushing and three scores, and caught an 85-yard touchdown pass from Weston Gloss. Gloss threw for 105 yards on 3 of 4 attempts. The Chargers’ three wins this season are the most by the school in a single season since 2006. Entering this season, Santa Fe Trail was a combined 10-80 the ten prior seasons. Caden Knoblauch booted a 39-yard field goal with 1:46 remaining in the game to break a scoreless tie and propel Kingman to a 3-0 win over Larned. The win moved to the Eagles record to 3-0. Kingman has yet to allow a point this season. Horton scored two touchdowns in the third quarter to beat Valley Falls 21-6. Derrick Stone rushed for a touchdown and caught a 34-yard touchdown pass from back Derek Richardson. Richardson rushed for a team-high 88 yards. Spencer DeLosSantos returned an interception 35 yards for another Chargers score. Hutchinson Trinity improved to 3-0 with a 40-6 win over Inman. The Celtics scored 20 points in the first quarter to take control. Elias Jasso-Cardenas rushed for 192 yards and three touchdowns on only eight carries to lead Trinity. The Celtics rushed for nearly 285 yards in the game. Brenden Miller passed for 120 yards and two scores to balance out Trinity’s running game. On Thursday night, St. Mary’s Colgan improved to 3-0 by slipping past Riverton 23-22. Panther quarterback Ryan Cedeno hit Ian Duncan on a 9-yard touchdown pass with just over a minute to go and Grant Cason’s PAT gave the Panthers the lead. Riverton threatened at the Panther 9-yard line with 20 second remaining but a bad snap out of the shot gun backed the Rams up to the 24. Riverton’s 41-yard field goal attempt was partially blocked as time expired. Sedgwick jumped out to a 21-0 halftime lead and went on to defeat Ell-Saline 41-12. Cardinals senior quarterback Bryle Ware passed for 139 yards and a touchdown, while rushing for more than 100 yards and a touchdown. Sedgwick’s Montana Kane ran for 100 yards and a touchdown. The Oswego Indians improved to 3-0 with a 36-14 win over Jayhawk-Linn. Oswego quarterback Johnathan Walker rushed for223 yards and three touchdowns on 25 attempts. Walker also passed for 31 yards. Indians junior Ethan Carter ran for 88 yards and a touchdown. Lyndon maintained its perfect record with a 47-18 win against Northern Heights. Lyndon running back Daniel Burgess rushed for 171 yards and four touchdowns on 22 carries. Quarterback Dawson Swinehart passed for 160 yard and rushed for 83 yards and a touchdown. Northern Heights’ Mason French passed for 99 yards and two touchdowns. Lincoln led Clifton-Clyde 28-12 heading into the fourth quarter and outscored the Eagles 22-6 in the fourth for a 50-18 win. Lincoln quarterback Zac Walter passed for 97 yards and a touchdown and rushed 14 times for 223 yards and four scores. Walter now has rushed for 634 yards and 13 scores and passed for 305 yards and five touchdowns this season. Udall used a 32-point second quarter to pull away from Oxford in a 54-6 win. Eagle quarterback Nolan Williams completed 7 of 9 passing for 119 yards and two touchdowns, and added 50 yards and a score on the ground. Dalton Loos led Udall with 115 yards rushing and two score, while Hunter Kistler added two more touchdown runs. The two teams will meet again in district play in Week 9. Hill City opened district play by doubling-up Quinter 40-20. Senior Deric McKeever rushed 27 times for 152 yards and a touchdown, while junior Garen Beckman added 144 yards and two scores on 14 attempts. Gage Hardiek also added 86 yards and a score in addition to tossing a touchdown pass. Quinter quarterback Tyler Waggoner passed for 192 yards and three scores in the loss. Fairfield outscored Norwich 102-56 in a wild tale of two halves. The Falcons scored 48 points in the first quarter and took a 76-50 lead at halftime. The two teams combined for only 32 points after halftime. Cannon Burns carried 32 times for 429 yards and nine touchdowns for Fairfield. Burns has now rushed for 1,130 yards and 16 touchdowns in the Falcon’s first three games. Norwich quarterback Nick Kyle completed 32 of 49 passes for 424 yards and eight touchdowns. Cale Goebel caught ten passes for 185 yards and five scores for the Eagles, while Davis Roe caught 15 balls for 133 yards and two scores. Northern Valley trailed 20-14 at halftime and into the fourth quarter before scoring a touchdown and two-point conversion to beat Atwood-Rawlins County 22-20. Husky quarterback Matt Stutsman completed 12 of 21 passes for 169 yards and two scores and rushed for 71 yards and another score. Clint Cole caught both Stutsman touchdown passes as part of his eight-catch, 138-yard night. Macrae Migchelbrink led the Buffs with 17 carries for 199 yards and two touchdowns. Ingalls built a 32-18 halftime lead and held on to defeat Minneola 50-38 thanks to 18 fourth-quarter points. Josh Irsik rushed for a pair of touchdowns and returned a kickoff 65 yards for another score. Zeke Cox rushed for two touchdowns and passed for another for the Bulldogs. 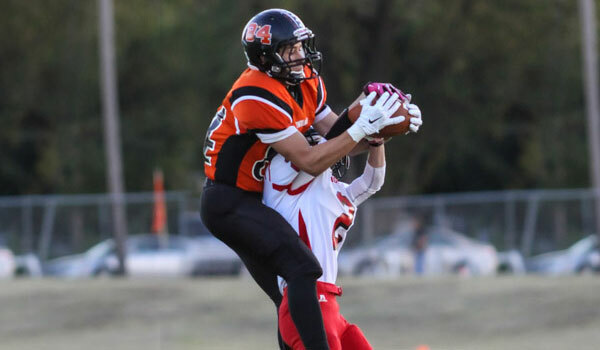 Joey Harrington passed for 170 yards and a touchdown and rushed for 194 yards and four scores to lead Minneola.